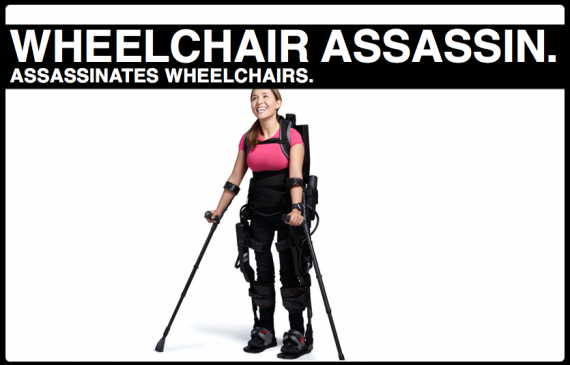 This lovely young woman is doing her part to destroy the wheelchair industry. And she’s a hero. Practical, admirable, and necessary, movements such as ADA and other anti-discriminatory legislation were essential for their time, but we should all be happy when technology renders them irrelevant. As I’ve said before, the technology that is the wheelchair has helped millions, but its time is finished – and the time of the wearable robot exoskeleton is approaching. 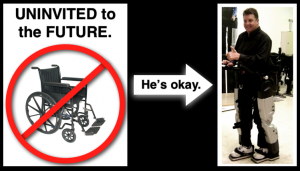 Unless you build wheelchairs or access ramps or any other specialized wheelchair-centric equipment, you’ve gotta agree that a mobility revolution for the disabled is long overdue (and if you do build such equipment, it’s time to diversify, yo). This post is really an update; this exact system came up here last May, then Berkeley Bionics (now renamed Ekso Bionics – a real lateral marketing move, I think) was just testing their prototype wheelchair killer. 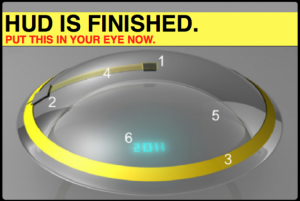 Now the device is moving through medical trials and appears to be fast-tracking to the market. These guys know what they’re doing – they’ve been at it since 2005, and their tech is also being used in Lockheed’s HULC exoskeleton. There’s a delicious irony or macro-serendipity or poetic justice (or, you know, something like that) to all this. 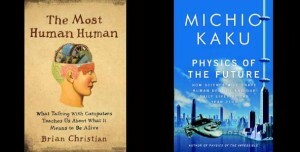 Whether through injury or disease, the physically disabled have long struggled through social inequality, mobility impairment, physical discomfort, etc., etc, on and on, are now they are in the driver’s seat of these novel human enhancement technologies – they are taking part in what I’d argue to be primitive steps toward practical transhumanism. Assuredly, there’s a long way to go from this bulky, basic exoskeleton. But the technological shift at work here is profound. Pioneers like amputee celebrities Aimee Mullins and Oscar Pistorious, they are living examples of how technology is blurring the line between what is considered practical, necessary augmentation and what, someday soon, might be just a nice alternative to flesh – an entirely voluntary upgrade. 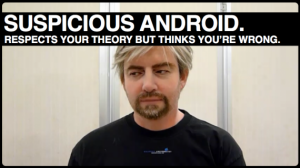 Oh, and laugh a little when watching that second company – the one called “Cyberdyne,” who named their suit “HAL.” It’s a Japanese company, and trust me – irony does not span the language and cultural barrier here. Goddamn Avatar. Around the year 2148 or whatev, while humanity had made itself some interstellar travel, there was still some dude rolling around in a wheelchair designed in the 1990s. James Cameron deserves his props (Avatar has netted over a billion dollars), but come on – wheelchairs and metal bullets and helicopters and not a single autonomous robot in the future? I AM SO SURE. The film is pretty to look at, BUT COME ON! ANACHRONISM EVERYWHERE! Just sayin.